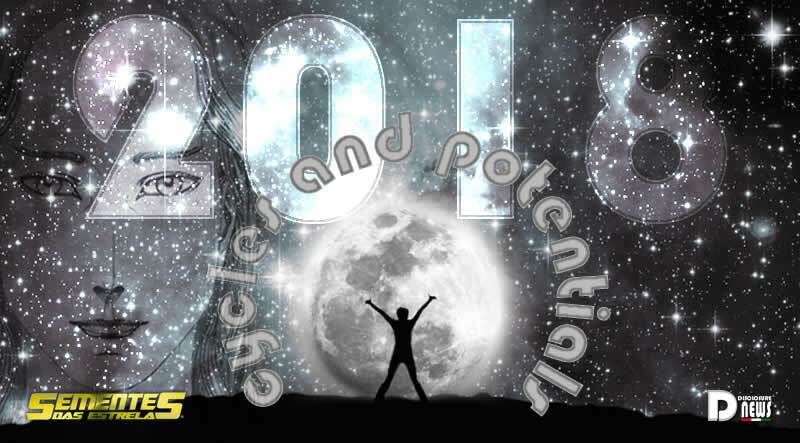 2018 Cycles and Potentials Ashtar. By Gabriel RL. It’s good to be here one more time. Another year, another cycle of learning, dear ones! Another creation of magnificent potential for the new window that opens. Yes, you have created it! You have moved the forces that created that potential. Your efforts as Workers and Warriors of Light were the fermenter, the ideal seasoning that brought them more strength, more Light, more wisdom, more awareness! More sure that the year that starts is a year of great potential, a great cycle. Year of opening and closing cycles. Welcome to the new year that will soon knock on your doors! Welcome to the Year of Potentials! Welcome to the Year of Cycles! Some of you, my dear ones, fear the closures of cycles because, normally, you do not know, at least consciously, what will come in the next. It’s always something new, that requires confidence to move forward. You have had a great opportunity this year to prepare for new cycles. Many of you suffered when they realized that something new was being born. They suffered because they had no control over it, and their egos were confused and frightened because they could not manage these changes. The year 2017 was just a boost for 2018, my dear ones! 2018 is a field of new cycles. It is a powerful vortex that will drag you to new experiences, new learning, new achievements. What you are too attached to will be “taken” from you by a greater force. The strength you created yourself. The force of change needed! From your Higher Selves, you have created the potential for 2018 to be a watershed for most of you. Well, my dear ones! And here we go for this year that most of you have decreed will be The Year! Broken cycles will be adjusted and renewed with the new energies, becoming new cycles. Completed cycles will be, harmoniously, led to new horizons, to new forms of expression. Dubious cycles will be called, drastically, to a final and definitive position. All will end at the close of an old cycle and start of a new one. Many of you will leave jobs that until 12/31/2017 have sworn you would remain the rest of your lives in, and here I can hear some of you saying, for example: “Well, mine, Ashtar, I will remain for the rest of my life…”. My dear, there are more things coming, and you will be amazed by yourself, you will close cycles and open new ones by yourself. Do not be surprised if, one day, you go to sleep in love with chocolates and the next day you can not stand it, and if you go to sleep in love with ice cream, but on the next day you prefer a glass of water. Things will change, and my message is to reassure you, you will have an amazing year! It’s the year that most of you have chosen to close and open cycles, drastically! But do not worry! All of this will flow naturally. Nothing will make you suffer. This is not, and never was, the purpose. Suffering will always come, only if there is resistance from yourselves. Or rather, your egos too attached to the old ways, too attached to the comfort zones, too attached to what you believe is safety. And in that, I have to say, my beloved ones: I am sorry, but most of you will be drawn to the NEW, to the new experiences, because yourselves – your Selves – have decreed that this is so, and no dramas, insecurities, doubts will hold it down. After all, you are being moved by your Higher Self, and you, on the deepest level, know that nothing will stop you. You are true Warriors and that is why I fully trust you. I remember being in a meeting thousands of years before you came to Earth. I was asked about you… An opposition brother 🙂 said, “Ashtar, do you really believe that they will do the work that you think they will do?” And smiled wryly. I said, “Yes!” And he spoke again: “But why? Why do you believe it so much? !” And I just said,”BECAUSE THEY ARE THEM!” 🙂 There is no more to say here. You are you and that is all. 2018, the year of the potentials! As I said, you’ve moved so many forces in 2017 that there’s no way you can not cite 2018 as a year of great potential for the visible changes you’re looking for. There’s been a lot going on behind the scenes, my dears! And what you have done, everything you have been doing, is generating such a powerful force that you are ensuring that “certain things” will definitely unfold in 2018 on the world stage. There is potential for a particular leader to break the silence and speak openly about us, and it will have an impact. Yes, we hope he has enough internal strength to do so. Either way… in one way or another, our presence in your heavens will be increasingly impacting to those who wish to keep us hidden. The strength you have generated will undoubtedly guarantee discoveries that will help all of humanity in the field of science and technology. What’s more, many of your scientists will start working directly with our fleets, even if they do not see it clearly. They will begin to receive more direct instructions about some things that need to be urgently implemented. The fear that comes from your medical community has to reveal the truth about the control of the pharmaceutical industry that will begin to dissipate dramatically because doctors are opening up and hearing more of the voice of the Self. In this, they will receive more force and it will be inevitable to stop them and prevent them from coming out to the public with complaints about the oppression they suffer and, consequently, there will be integration into a more quantum medicine. The Arcturian and Sirian Families will be helping them, as they open to them. This is a potential, a potential created by you Lightworkers and Lightwarriors! You have created this energy, this potential, and you will certainly sustain it! We will support you in this! The behind-the-scenes moves will no longer be so “underneath the rags,” because you’re already ready for truth, and that’s another great potential! YOU WISH TO KNOW THE TRUTH, AND IT SHALL COME! No matter what it costs, it will come, my dear ones! More people will come and report what they know. They will point out crimes committed against humanity by opponents and these will be recognized, and measures will be taken so that they will no longer harm the human species. I’m taking care of it myself. Of course, they know that Love is the only way to redemption for those souls so charged with pride and lack of love. And I myself will show them that yes, there is a Light at the bottom of the abyss and that Light is there to propel them back up. I repeat: I will take care of it. So do not judge them. Do not throw hateful vibrations against them. Send Love, send Light, and let the forces in charge of taking care of them physically do the rest. I myself will be instructing dedicated cops to do what they need to do, to do their work with their hearts laden with Love. The law needs and will be fulfilled, but it will be with Love and respect. My dear ones, the Akashic will be more intensely liberated. Many of you will remember past lives with greater clarity. They will remember lives even before Earth. You are reconnecting to all that you are. The veil is being dissipated and it is inevitable that the entire history of the cosmos within you will reveals to yourself, inwardly. Many will say, “Ah! I knew it!” Because they will know things, spontaneously, without “never” (at least in this life) had studied or tried to know it. They will simply look at and say something like, “Well, that’s the way it is, and it works that way.” Simply, you will know! Many will have visions of the past, the will to travel to specific places because they will simply know that they have already been there and/or need to anchor or do something like that, in that place. They will look at a relative, friend or partner and will say, “Well, we were together in another life. We did it, did that, etc.,” without much effort. It’s a potential. A great potential because you have moved the forces for it! So, uphold them! We will help you! My dear ones, you certainly know 2018 will not be “just that“. There are more things coming! That’s just a little idea of ​​what you’ve prepared for yourself! These things are just great potentials already pre-established, because you have decreed them! And you will certainly support them. Why? Well, because you are you! You are not finished yet 2017, but there is still time to create new potentials and launch them for 2018! And, of course, also in 2018, you will have all year to continue creating new potentials! Well… you do not have to wait until 2018! Create more, now. Right now! Make your moment now a GREAT POTENTIAL! You are you. You do not need to know more! I guarantee! This entry was posted in Uncategorized and tagged Ashtar, cycles, Disclosure News Italia, Gabriel RL, joy, love, new beginnings. Bookmark the permalink.